Chinese tradition holds that babies born in the year of the pig will be full of life, but focused. Chinese tradition holds that babies born during the year of the pig (2/16/2019—2/4/2020) will be optimistic and energetic, but also gentle and focused. 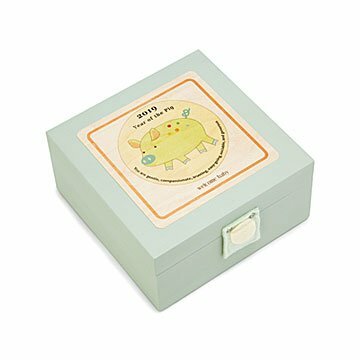 Mark your new arrival's unique character traits as they grow with this adorable keepsake box. Designed by Kerri Lee, the felt-lined wooden design comes with a tiny envelope for holding a lock of hair along with space to write your baby's name and birth date. It's a charming place to keep their first pair of booties, a favorite toy, or pictures from their first year. Handmade in Long Eddy, New York. Got one the year my first grandchild was born and got another for the new grandchild. Raising a daughter myself, I know how important a treasure/keepsake box can be. I also want this gift to spur the seeking of more... Of cultures and people, the lunar calendar, wisdom, and goodness. I personally have always had an interest in Asian cultures and I hope many things in her life will spark an interest in people. I gave this as a baby shower gift...put a 2019 penny and pair of baby booties inside! Awesome! !